In the diagram above Paulson describes certain stations as turning points. The “Business Pressure” station is marked by mental worry and sedentary habits. “Wretched Sanitation” refers to lack of fresh air and abundance of germs. The “Unnatural Demands of Modern Society” places blame on late hours and evening entertainment. The final station, “Intemperance and Dissipation,” is plagued by immorality, tobacco, and poor diet. Notice that at every station there is a “Reform” signal, a marker to let you know it’s time to make a U-turn toward health. From: Walker, K. Living Your Later Years. New York: Oxford University Press; c1954. 1. Paulson D. The road from life to death. Good Health. 1899;34(8):481-482. 2. The State of Aging and Health in America 2013. Atlanta: CDC; 2013:60. Available at: http://www.cdc.gov/features/agingandhealth/state_of_aging_and_health_in_america_2013.pdf. 3. Walker, K. Living Your Later Years. New York: Oxford University Press; c1954. 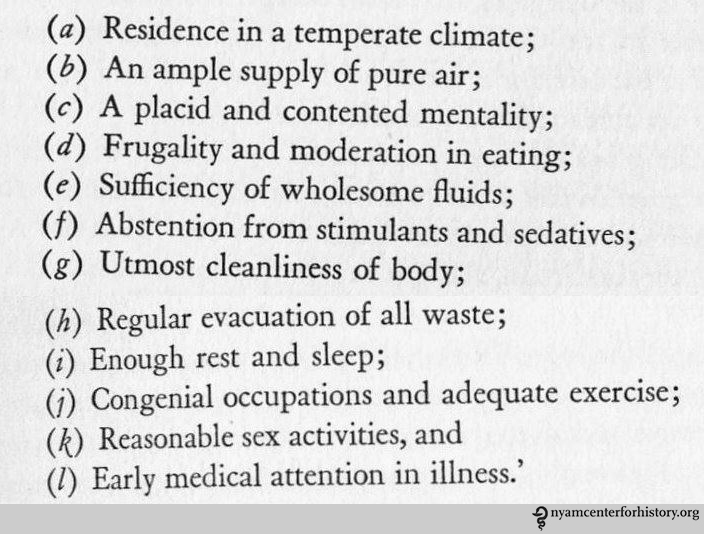 This entry was posted in Collections, History of medicine and tagged aging, healthy aging, Healthy Aging Month by nyamhistorymed. Bookmark the permalink. I suspect that the “unnatural demands of modern society” are at the root of several of the other problems, although we do live much longer than our predecessors–on average.